The Secret Life of the Sparrowhawk. A film 10 years in the Making ... I was told it was virtually impossible to do! The film covers the lives of sparrowhawks throughout the year from November to August when all adult and juvenile sparrowhawks disperse and covers why up to 19 species of songbird choose to nest right next to it. The closer the songbirds nest to the sparrowhawk the more successful they are in rearing there broods keeping the balance of nature just right. 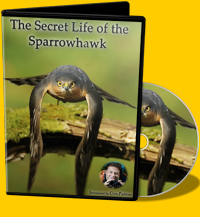 Purchase your very own copy of The Secret Life of the Sparrowhawk by using the links below. All payments are taken securely via PayPal. These are people who helped me along my mammoth journey as an unknown film maker making a film i was told virtually impossible to do 10 years in the making,the film covers the whole lives of the sparrowhawk. The Secret Life of the Sparrowhawk covers why songbirds choose to nest right next to the sparrowhawk, the sparrowhawk has always been persecuted and very much misunderstood, the sparrowhawk plays a big part in the songbirds lives at times giving them protection to raise up to 3 successful broods nesting right under its feet. This helps to keep the balance of nature just right! The DVD will be available from around the 28th October 2012, this is a world first and all of my footage is of wild birds and animals nothing faked by using pet birds or animals. A sneak peak at what you can expect in "The Secret Life of the Sparrowhawk"
The Secret Life of the Tawny Owl. After spending 10 years filming the lives of Sparrowhawks ... a pair of Tawny Owls moved onto the island forcing the sparrowhawks out. This gave me an opportunity to film another of our great and very elusive British birds' lives. Tawny Owls are often heard but very rarely seen, until now. Purchase your very own copy of The Secret Life of the Tawny Owl by using the links below. All payments are taken securely via PayPal. Buy both The Secret Life of the Sparrow Hawk and The Secret Life of the Tawny Owl together. My new film took five years to achieve! special moments. A lot more happens in the daytime than many people realise and so, to capture all the activity that I could during the day, I'd grab just 4 hours a day to sleep. The Secret Life of the Tawny Owl covers all the breeding season from November to August when the juvenile owls are pushed away to find there own way in life. It will be a great struggle for them to establish their own territory and many never make it. The DVD will be available from around the 30th November 2015, this is a world first and all of my footage is of wild birds and animals nothing faked by using pet birds or animals. A sneak peak at what you can expect in "The Secret Life of the Tawny Owl"
Our live streaming web cams are permanently fixed in our wood in Cheshire, England and capture much of the goings on in a Sparrowhawk’s typical daily routine. "Not your average cam site...."
This isn't your average online web cam site. Our web cams allow us to follow every aspect of the sparrowhawks life, whether its in the nest, feeding time or the male bringing kills in. You will see the female Sparrowhawk leave the nest and take the kill away from the male to feed herself and her chicks. We also have web cams focused on our mating and courtship branch and of course a secondary web cam trained on our watering hole. The rest of the cams are situated throughout the wood in all of their favourite hotspots, this means you're guaranteed a good show. Take a look at some of our FREE Sparrowhawk footage and video clips. Our FREE videos can also be found on YouTube. 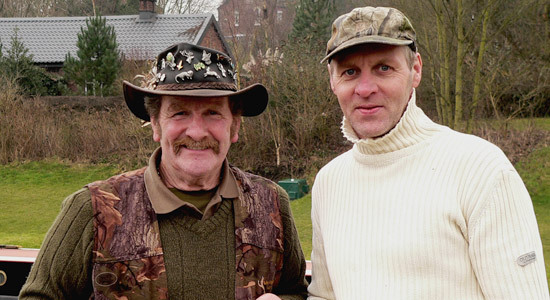 February 2010 was spent filming footage of wildlife on our river weaver with filming legend Johnny Kingdom. Out and about at some of the recent UK bird shows. Pete McMurdie during filming some of the fantastic footage for our website. 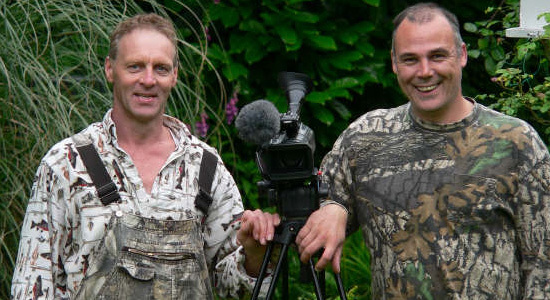 Rupert Smith (Johnny Kingdom's Cameraman), during filming of footage of these illusive birds. He is currently in talks about making a film showcasing the Sparrowhawk. 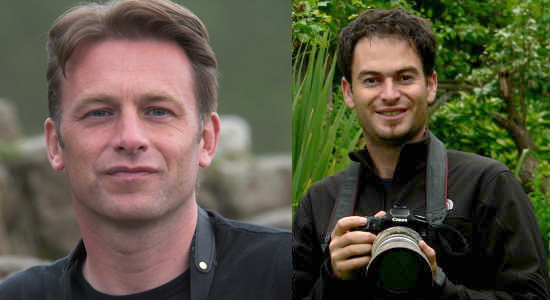 Chris Packham shall be joining us throughout Spring 2010 as this is his favourite British Bird. 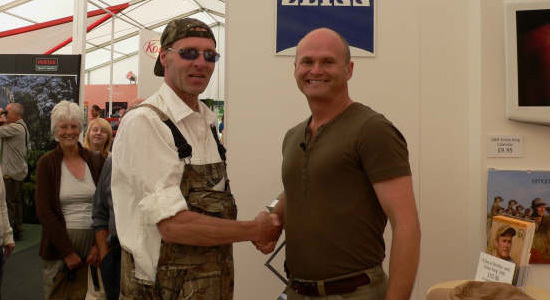 Meeting Simon King during the Rutland Bird fair. Whilst with Simon, several film clips and images were passed over to him to view our Sparrowhawks in the wild.